Katzman Lampert & Stoll is currently representing several victims in this case. 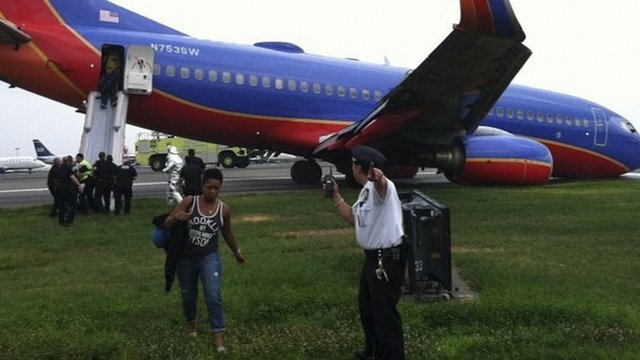 (Nashville, TN Tuesday, December 15, 2015) A Boeing 737 passenger aircraft, operated by Southwest Airlines, became stuck in the grass bordering a taxiway, injuring 8 out of the 133 passengers and crew members onboard. At the time of the accident, the plane was approaching the gate at the Nashville International Airport in Nashville, Tennessee, United States of America. According to a Southwest spokesperson, all passengers and crew were evacuated safely, and there were no fatalities, although the extent of the injuries suffered was not immediately available. An investigation by the FAA is ongoing. Katzman Lampert & Stoll is currently representing several victims in this case. Since our team is already intimately familiar with the details of this incident, if you were injured in this accident perhaps you would like to consult with one of our experienced aviation lawyers? (April 18, 2018) At this time, our thoughts and prayers are with the victims of the horrible tragedy that befell the passengers and crew of Southwest Airlines Flight 1380. As government investigators along with representatives from Southwest Airlines, Boeing, and CFM International commence their investigation of what presently appears to be a fan blade failure, the answers to certain questions should be paramount for the flying public. Has this failure mode occurred in the past, why was this failure uncontained, and was this incident preventable? The CFM56 series engines incorporate a large rotating fan to produce thrust necessary for flight. Fan blade failures in turbofan engines are not a new phenomenon in aviation and yesterday’s incident is not the first time it has occurred in a CFM engine. The fan blades in the CFM turbofan engine are subject to many different stresses and must be designed to withstand them and inspected to ensure integrity. On January 8, 1989, a Boeing 737-400 equipped with two CFM56-3C turbofan engines experienced a fan blade failure. This incident is known as the Kegworth Air Disaster. Authorities attributed the blade failure to metal fatigue caused by heavy vibration. Thirty-nine people died in that tragedy. On August 27, 2017, a Boeing 737-700 operated by Southwest Airlines experienced an uncontained turbofan blade failure on a flight from New Orleans to Orlando. Pieces of the engine punctured the aircraft’s fuselage. Fortunately, there were no casualties. Again, authorities attribute this failure to fatigue crack growth in the fan blade. The regulatory system we have in place is supposed to prevent design induced malfunctions. Manufacturers boast of a rigorous certification process wherein the FAA approves the design of an aircraft or component. Design defects, however, do exist and when discovered after certification are supposed to be addressed through the issuance of an airworthiness directive. Airworthiness directives identify an unsafe condition and can impose design change or augment inspections to catch a failure before it occurs. In 2010, the FAA issued an airworthiness directive against CFM56-3 series engines after “a report of a failed fan blade with severe out of limit wear…” This AD required periodic inspections of fan blades. In 2017, the FAA proposed an airworthiness directive against the CFM56-7B turbofan engines. This proposed AD requires an ultrasonic inspection of fan blades and replacement of any worn blades. The FAA estimated this additional inspection would cost $170.00 per aircraft and involve only 2 hours of maintenance. Consequently, the European Aviation Safety Agency issued an airworthiness directive mandating the blade inspections in Europe on March 26, 2018. Inspections are important, but so too is a redundant or failsafe design. Both Flight 1380 and Flight 3472 experienced “uncontained” failures. This means projectiles from the failed engine penetrated through or out of the engine cowling. Engines are, or at least intended to be, designed so that projectiles resulting from an engine failure are contained within the cowling. Projectiles struck the aircraft when Flight 3472 experienced its emergency and in the disaster that befell Flight 1380. This commonality raises the question whether the focus on fan blade inspections is overshadowing the element of failure containment. An aircraft accident or incident is rarely a first-time event. The service history of a product line tells a story. The maintenance history of a product tells a story. All too often, these stories warn of an impending incident. We can only hope that the investigation of Southwest 1380, involving CFM International, Boeing, and Southwest will inform the flying public of the root cause of the blade failure, whether the inspections contemplated by the FAA airworthiness directive were conducted and if so, why the blade failed prematurely. In 1989, the Kegworth disaster warned of the seriousness of the danger. In 2017, Flight 3472 warned that an uncontained fan blade failure was still a threat to aviation. The flying public has a right to know why the disaster that befell Flight 1380 was not prevented. The Law Firm of Katzman Lampert and Stoll has recently represented victims of several engine turbofan blade failures.